Description: 4 maps on 1 sheet. Jersey, Guernsey, Farne and Holy Island. Hand coloured. Description: Channel Islands. Jersey, Guernsey, Sark, and Herm. Splendid decorative cartouches. Fine original hand-colour. Description: Sea chart of the Channel Islands and Western Normandy. Published simultaneously by Jaillot and Pierre Mortier, this chart was later adopted by the French Admiralty with the official stamp of the Depot de la Marine. Description: Stunning chart of Guernsey, Herm and Sark. Description: Jersey, Guensey and Alderney and the coast of Brittany and Normandy in Northern France presented in a grand sea chart with decorative cartouche. Strong impression. 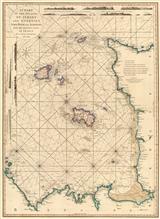 Title: : A New and Correct Chart of the Islands of Jersey, Guernsey and Alderney, &c. with the Coast of France, from Neville to the Isles of Brehat. Description: Jersey, Guernsey and Alderney, Herm and Sark in the English Channel with the Northern Coast of France. Coloured. Description: Stunning copper engraved sea chart of the Channel Islands in original colour. Description: Guernsey. Miniature map of the island. Coloured. Description: Guernsey. Attractive map with decorative cartouche. Original colour. Description: The island of Jersey based on the survey of Philip Dumaresq who produced a work on the island in the late 17th century. This was archived by the Crown until the late 18th century. Original hand colour. 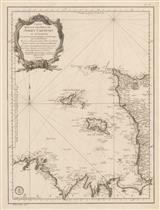 Description: Two maps on one sheet showing Guernsey and Alderney in the Channel Islands. Original hand colour. Description: Jersey. Small but detailed map of the island with all of the roads and many individual buildings marked. Original hand-colour. Description: Guernsey, Herm, Sark, and Alderney. Individual buildings are marked on the larger of the islands. Original hand-colour. Description: A coloured map embellished with an elaborate border. Description: Decorative map of Jersey and Guernsey set within vignettes. Description: Guernsey, Herm and Sark. Superby detailed black and white sea chart with corrections to 1928 and a small overlay dated 1930.